When we go camping, we bang in the pegs, bang in the pegs, bang in the pegs. Guy ropes are tricky; they trip up our legs! Smacketty tappetty bopp-io. 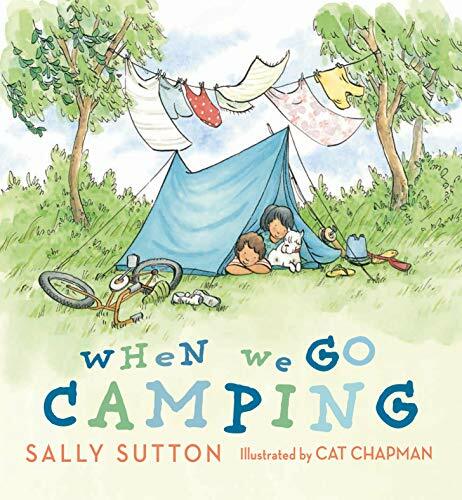 From the award-winning and bestselling author of Roadworks, Demolition and Construction comes a rollicking read-aloud celebration of camping, perfect for sharing together on the family camping trip! The whole family are away – banging in pegs, fishing for dinner, and singing round the campfire! Hummetty strummetty squeak-io. With gorgeous watercolour art, and delightfully rhythmical refrains, this story captures all the fun, excitement and joy of being in the great outdoors!